Love Makes a Way protest ended in 11 arrests yesterday. These women are willing to be arrested for what they believe in. You don’t often imagine a protest movement involving candles, prayer and the singing of hymns. 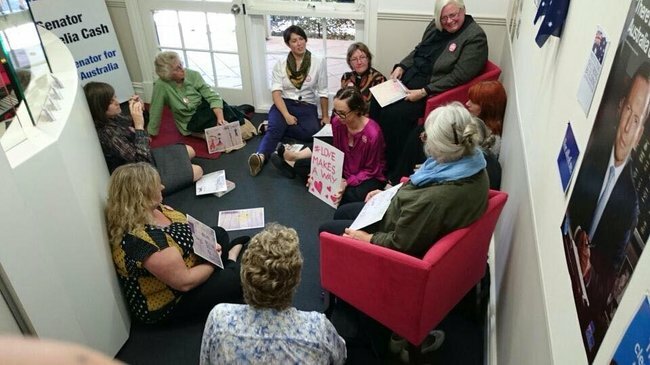 But yesterday, to mark White Ribbon Day, that’s exactly how 11 female Christian activists protested the detention of 726 child asylum seekers in the office of Western Australian Senator and Assistant Minister for Immigration and Minister Assisting the Prime Minister for Women, Michaelia Cash. 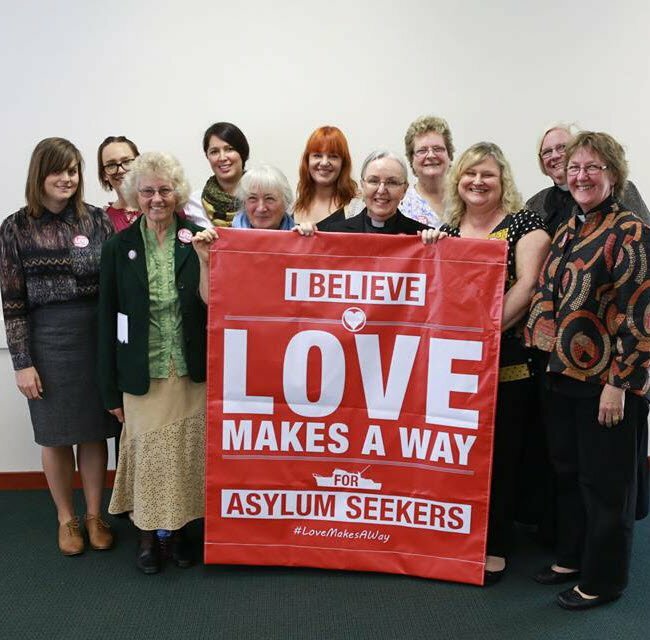 These women are the latest activists to join “Love Makes A Way”, a movement of religious leaders taking non-violent actions in the offices of Federal MPs to demand a timetable for the release of children in Australia’s immigration detention centres. One protester, Teresa Lee, points to a Fairfax report from September uncovering significant allegations of abuse of children and violence against women. “As Australian women we want to see the end of violence against women, and this should include the women in our care. This is in line with what White Ribbon Day is about,” Teresa says. The protesters before they entered the office. Teresa is a mother and a social worker. But she also lives in a community of settled refugees in Perth through the First Home Project. She draws a direct link from those she lives with to her protest action for asylum seekers currently being held in detention. Most activists who have participated in Love Makes A Way protest actions have been arrested and so I ask Teresa how she feels about that prospect. 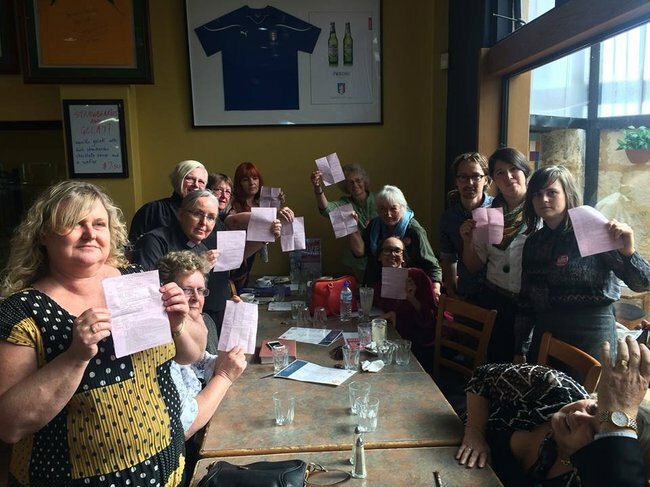 All 11 women who occupied Senator Cash’s office were eventually arrested by police, read their rights, then driven two suburbs away and released at a train station. 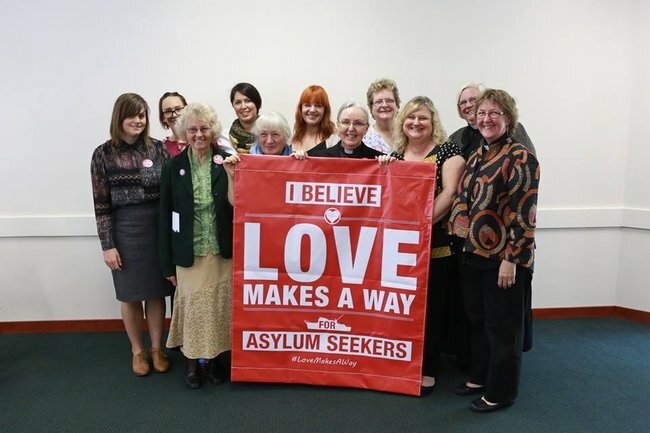 However, Love Makes A Way cites an Australian and New Zealand study that shows where children have been detained for over a year 100% of them suffer from some form of mental illness directly related to their detention. Movement Leader Jarrod McKenna repeats reports from refugee advocates that women in detention are forced to queue for sanitary products, and are forced to shower in front male detention centre staff. He repeats reports heard by the Australian Human Rights Commission that babies don’t have adequate space to learn to crawl, and don’t have access to the health and medical attention they require. The 11 women after the protest. “People are willing to go to gaol until these children and their families are released from gaol-like conditions,” he said.